One of the most common questions we get when meeting new people is, “So, what do you do?” Most of us have a standard answer about our profession, but there are some people who have jobs that you might not even know existed. More importantly, everyone’s job is important and in some way improves the lives of others. Think about every job that affects your household; there are a lot. I was reminded of this yesterday when in Perkins Cove, Ogunquit, Maine. This is a lobstering port and a beautiful place with shops and restaurants. While exploring we came across a boat named the SS Crusher that had been dry docked (see picture). It was a cool looking boat and I wondered what was up with it. Then, I found that a children’s book, The Pride Of Perkins Cove, had been written about it by Brenda Yorke Goodale about the boat. So, of course I had to dig deeper and found that the boat and it’s harbormaster have very important jobs. When it gets cold, and it gets cold in Maine; Perkins Cove freezes. Because the Cove is a working port, it has to stay open, so Harbormaster Fred Mayo spends hours every day breaking the ice. The town’s special boat, the SS Crusher, is built for the task of “crushing” through the ice. Before yesterday I did not even know what a lobstering port looked liked, let alone that freezing was a problem. A few weeks ago I read a great book by Shawn Achor entitled Big Potential: How Transforming The Pursuit Of Success Raises Our Achievement, Happiness, and Well-Being. In the book, Achor points out that we usually just give a very quit and boring answer of what we do for our job. He argued, however, that we need to quit this and give what he calls the “elevated speech;” not to be mistaken with the elevator speech. The “elevated speech” should be us telling what we really do and why what we do is so important. The example I like to give here is the answer that we hear so many times from teachers: “Oh, I’m just a teacher.” I’ll admit I’m guilty of having done this. But, are you kidding me, “just a teacher?” I think not! Actually, I hope not! Let’s take a look at teaching as a very significant profession, or “job.” Here is my elevated version: “Teachers have been given a great gift – the power to change lives, each day I must be inspirational. I am a significant human being helping other human beings to realize their full potential and go on and make a positive difference in their world.” What do you think? engaged – involved in, enthusiastic about and committed to their work and workplace (Gallup, 2017). This translates to only 4 in 10 U.S. employees strongly agreeing that in the last year, they have had opportunities to learn and grow (Gallup,2017). This is a huge engagement issue. Gallup (2017) results suggested that by moving that ratio to eight in 10 employees, organizations could realize 44% less absenteeism, 41% fewer safety incidents, 24% higher retention, and 16% higher productivity. I guess it is time to elevate those we serve. Just like the story of the SS Crusher, we all have unique gifts, jobs to do, and make a significant difference in the world. Let’s get engaged and elevated! What’s your elevated story? Today, I had the honor of being in attendance at the 2nd Annual Global Smart Manufacturing Summit in Berlin, Germany. One of the topics we grappled with was of what does Industry 4.0 mean? Ron Zahavi, Chief Strategist for IoT Standards and Consortia, Microsoft Corporation did a great job of walking us through some history. Interestingly, in all these cases technology and mechanization are involved, but in the revolutions of Industry 1.0, 2.0, and 3.0, I wonder if we forgot how important people are. We must remember as we navigate Industry 4.0 that people are more important that the devices and technology. In my world of educating young scholars and creating education policy, we have a responsibility to make sure as we move to Industry 4.0 to put people at the forefront. We do not want to make the same human mistakes with 4.0 that we made with the first three revolutions. I really believe more than ever that we must make sure that we create space for industry to do as much of the training of our students as possible. Industry is in a good position to do this. What we have to do, though, is identify the transferable skills students need and institutionalize those skills in the framework of the internship learning being done in partnership with industry. This is crucial because of the mobility of our students. We must be educating our students on the new things being done with Industry 4.0, but must also be educating them on the benefits. In other words, answering the question: How does this make life easier? Not just always pointing to financial improvement and the bottom line. We must begin to develop a workforce made up of the right quantity and right quality of workers. The skills we are preparing students with must match the needs of the workplace. Industry 4.0 will require new skill sets, and manufacturers will need to attract the right talent. This may involve partnering with k-12 schools to train students. Existing training programs may need to be expanded to include new technologies that are introduced to the marketplace. Manufacturers also need to recruit for Industry 4.0, which may differ from how they have done it in the past. Both business and industry and education will need to stop all focus being on qualifications determined by degrees and certificates, companies should recruit for capabilities to succeed. These capabilities will include specialized skills. For us to compete during Industry 4.0, it will require us to conduct constant iteration and be flexible. It’s not about buying software or purchasing a curriculum and then watching it all play out. To compete in Industry 4.0, the education sector and manufacturers must be flexible and agile in the face of change, and, most importantly, partner together. This past weekend at the kickoff of our Indy 3D Leadership Program for education leadership we did a session on norm building for our learning journey. I had put together a few example norms to get the juices flowing. One of the examples was #9. Explore Heuristically. This caused quite the discussion. Of course, that was my intent! I have to give credit where credit is due on the thought of exploring heuristically. This came from my good friend and great graphic facilitator, Mike Fleisch. Everything he does as a facilitator is heuristic and I really respect that about him and have learned a lot from him on how to let learning happen organically. Any approach to problem solving, learning, or discovery that employs a practical method not guaranteed to be optimal or perfect (Wikipedia). Often enough the search ends in no overt positive conclusion (Dictionary.com). Describing an approach to learning by trying without necessarily having an organized hypothesis or way of proving that the results proved or disproved the hypothesis. That is, “seat-of-the-pants” or “trial-by-error” learning (WhatIs.com). Now let’s dig a little deeper. It is really deriving an answer from experience. In other words, enabling a person to discover or learn something for themselves. So, wouldn’t it make sense to learn heuristically when in a group, from the experience of everyone in the group. This gives us the chance to explore the possibilities rather than a set of rules. Leadership learning developed by most organizations seems to be one where system developed provisions over-shadows individuals taking personal responsibility for their leadership learning. I believe we must endeavor to create a balance between organization and individual agendas, with the pendulum swung more toward the individual side. Amazingly, we talk a lot about differentiating and individualization of education for our students but we don’t do a very good job of it with adults. Furthermore, it has been my experience that adults really like to learn in the same way we learned when we were kids. Therefore, we should create more leadership learning models that make use of heuristic pedagogy and tools. To me this was a great model of heuristic learning. I designed this model building activity as a starting point only, intended to help leaders identify the state of their current knowledge about leadership as well as their future professional development needs. The Mr. and Mrs. Potato Head models were used to show his or her current leadership knowledge profile and the knowledge fields on which he or she will need to focus their learning in the future. Heuristically, the Mr. and Mrs. Potato Head model building guided discovery and investigation. This allowed participants a rare chance for reflection. This reflection allowed participants to learn things about themselves and for themselves. As opposed to traditional learning which usually employs facts, theories and postulations, heuristic learning involves testing, doing, practice, trying, and listening to others’ experiences. One of my heroes, Thomas Edison, was the ideal role model of learning heuristically. You all know the famous story of how Thomas Edison invented the incandescent light bulb after 1000s of unsuccessful attempts. In fact we have all heard the quote from Edison when he said, “I have not failed 1000 times, but I have discovered 1000 ways how not to invent the light bulb.” Are you exploring heuristically? Better yet, how are you helping others explore heuristically? We’ve all seen it in a TV show. The character goes to her boss or parents with a bright idea, the idea is ridiculed, and then (sometimes in the same breath), the idea is repeated right back, word for word. And, get this, it then becomes a great idea and he is glad he thought of it, too! Unfortunately, these people do exist. In every company, in every organization, in every community, in every political party. Some might not have as bad a case of it as others, but at some point, we will run into one of these people, or an entire organization of these vane people. Furthermore, I have even experienced not being able to reach compromise or consensus because certain individuals ideas weren’t being used or he had not come up with the idea. This level of ego and vanity is amazing to me. When faced with these type of situations I always remind myself and the group I am working with of the great thought of our 33rd President, Harry S. Truman, “It Is Amazing What You Can Accomplish If You Do Not Care Who Gets the Credit.” My choice has always been to favor the accomplishment of the idea, rather than worrying about getting credit for it. Really, very few accomplishments can be credited to any single person anyway. This very topic was the subject of the chapter I was reading this morning in the awesome book I am currently reading, Leading Like Madiba: Leadership Lessons From Nelson Mandela by Martin Kalungu Banda. In this chapter, Kalungu Banda teaches us that sharing the credit is a mark of great leadership. An interview of Nelson Mandela is the subject here where he shows that success is often the result of concerted effort by many people. In the interview Mandela says, “…the reality of our struggle is that no individual among us can claim to have played a greater role than the rest.” To me, this says it all – it took (or will take) everyone, not just one! We have all seen people who have become so caught up in what they think they have accomplished that they forget there are/were a lot of of others working on that same issue with them. Even if it is your idea, would you rather be right, or get the idea implemented? How much do you value your vanity, your pride? 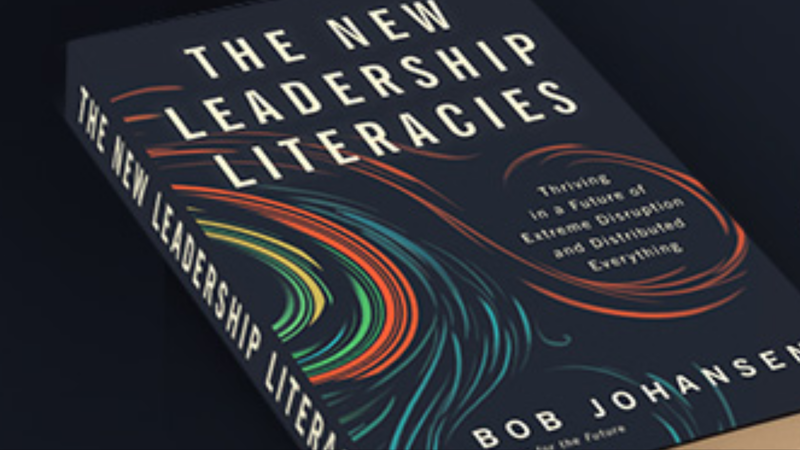 This guest post is an excerpt from The New Leadership Literacies (Johansen, 2017). David Rock is the founder the Neuroleaderhip Institute in New York, the first research group that is integrating neuroscience and leadership principles. They are studying things like job performance. They argue that many of the classic performance review systems trigger fight or flight mechanism in our brain and have exactly opposite effect from what we like to have. They draw upon neuroscience research and bridge to what they research means in a work environment. The SCARF model suggests that, in order to be balanced and productive, our brains need to feel a sense of status, some certainty that provides grounding, autonomy to for self strength, balanced with a sense of relatedness to others, and finally a sense of fairness in the system. Without these brain balance basics, we feel sapped of energy.